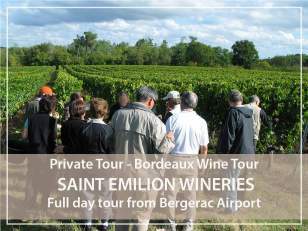 Discover the Saint-Emilion wineries and the superb medieval village with a pick-up at Bergerac airport! Pick-up of your group at Bergerac airport. Commented transfer with your licensed guide and driver to Saint-Emilion wine country (60 km - about 1 hour drive). Visit Saint-Emilion, beyond wine: a amazing medieval village! During the day, we will schedule 2 wine tastings in wineries to discover the great characteristics of this world-famous wines. Saint-Emilion wines are worldwide renowned for their quality : come and discover the secrets of blending our grape varieties and taste our elegant wines, dominated by Merlot which is the king here, on our clay-limestone soils. Thanks to very strict production criterias, each vintage is unique because the Saint-Emilion appellation offers a multifaceted terroir.